Press the LUI Aura Button on the Main Menu / Escape Menu to open the option panel. Support for Dynamic Aura Groups. Support for Trigger Groups with individual group behavior. Support for Focus Target / Target of Target tracking. Support for Ingame Sharing as well as importing, exporting auras, aura-groups, bars, spells, trigger. Support for Spellslinger abilities (surged) and Engineer Bot Abilities. Show auras only in certain zones/subzones like Datascape -> Avatus. Show auras only when using certain Actionsets and/or Stances. Predefined Auras/Buffs/Debuffs for Datascape, Genetic Archives and Augmentors. Over 1000 different icons / sprites / textures. More options and ways to setup your aura, than you can ever imagine! Lua event handler has exceeded 2501 ms.
As the error message says, I can't get spell icons to show up. 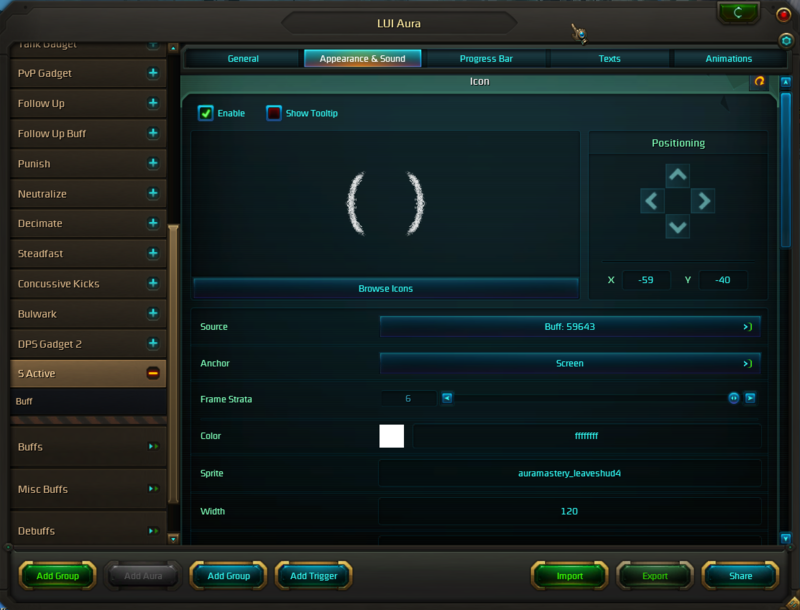 I can go into the UI and set up auras, but nothing actually happens. I also get this same error when trying to run Auramastery but not on other Addons, perhaps there's a connection? first of all. Great Addon. Been using it for quite a while now and i really enjoy it. Sadly the Website http://www.luidb.com is not reachable anymore :/ . I have one Question. Is there some kind of trigger, where i can say like "Only Show this Aura when Ability "XYZ" is in LAS? Through the Addon Builder i have multiple Builds with different Skills but the Auras are showing all at the same time. Hi. I recently installed the addon and everything was working fine on my Engineer. But when I jump onto my Esper I get the following error. I can load the addon on all other classes except: Esper, Medic, and Stalker. I've tried uninstalling and resetting all my addons with no luck. Any other options you can provide. Thank you in advance. I found the fix. 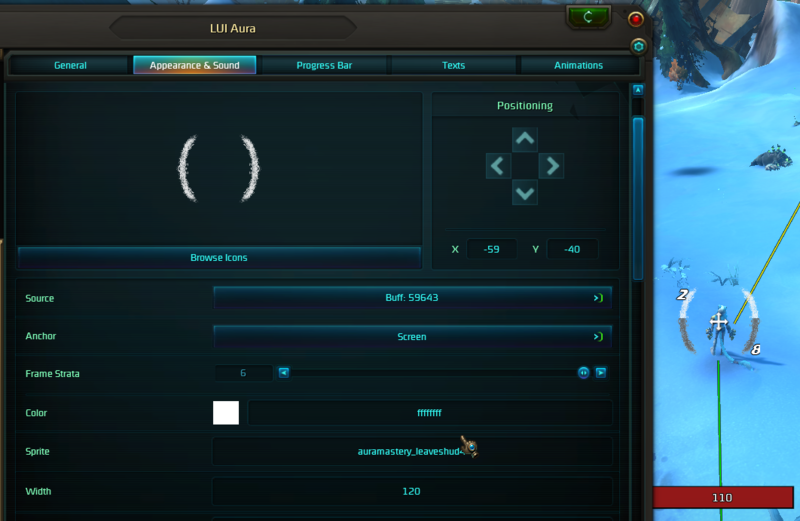 Under the Wildstar/AddonSaveData I had to remove the LUI_Aura_0_Gen file each time I logged into my Esper, Medic, and Stalker. That forced a new file to be created and allowed me to use the addon without the error. Thanks. Aura for T8 Locus of Power (https://pastebin.com/1qpfzDB4) almost always stops working after switching zones, after /reloadui it it working fine again, until zone switch (not 100% sure about zones switching in open world, but I think it never was working after switching between dungeons/expedition and open world). I've found the problem: it was because of anchor set to "player", with "screen" it works fine even when switching zones. This error occurred when updating from a super super old version, when the addon pretty much was trying to tell you, that you will lose some saved variables, since they could not get restored because of the huge version difference. So you may want to reset the addon to default and start from scratch to be super safe. If you already have some auras / aura groups, you can export them first and import them later. The PTR broke this addon, we're technically not getting errors but none of the auras are showing up. Could you have a look at this? Carbine got rid of an EventHandler that was used in LUI Aura and a lot of other addons. Since they already deployed this update on the live server (good job carbine! ffs! ), i uploaded a fix right away. Sorry for the lack of communication and updates within the last few days/weeks. I was super busy working on LUI BossMods so everything else had to fall kinda short for a while. Everything should be more or less back to normal within the next few days. Feels like some API changes, no auras work for me that i copied from Live. Maybe carbine broke something or they intentionally changed something, who knows. We could wait for Patchnotes (soon™). thanks for letting me know. i already talked with zod about the changes and will take a closer look at it in the next few days. 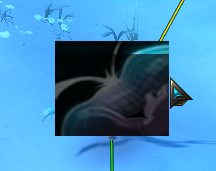 Found another issue that happens with icon appearance. delete your icon source, so your sprite does not get overwritten by the sprite of your buff trigger. In case I am not completely blind, are there any plans for making this addon capable of being cross character? No plans currently, since the demands for auras are pretty different depending on which class you play. If you want to copy some auras from charA to charB please use the Import/Export functions.